Capri, Italy is a unique vacation destination where you can enjoy great sunsets over the ocean, romantic dinners, and take a boat into the Blue Grotto. Visit the island from May to September. If you get lucky with the weather, the end of September can be a good time to go because it is much less crowded than in the summer. Fly into Naples and take a ferry or hydrofoil to the island. Once you arrive in the port, you can reach your destination by bus or taxi. Most hotels offer shuttle service from the port. Keep your eyes closed if you plan to ride the bus. Some of the turns on the narrow roads will take your breath away. Capri is small, so don't bring too much or you will find out how uncomfortable it is to haul your luggage in and out of a small bus or cab. If you have time, you can stay on the Amalfi Coast for a few days as well. The picturesque towns of Capri and Anacapri, famous attractions such as the Blue Grotto, and romantic sunsets make Capri one of the top vacation spots especially popular with honeymooners. The property is set on top of a hill and offers 150 rooms and suites, many overlooking the manicured gardens and the outdoor pool. 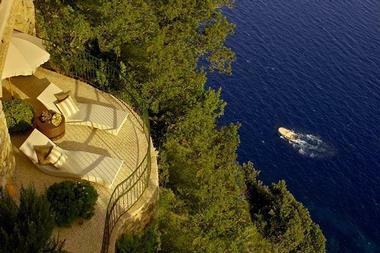 Seven romantic suites each come with a scenic terrace. In addition to the large pool area, there are two tennis courts and a full-service wellness center. Quisi Club Italian Spa provides a wide range of facial and body treatments. 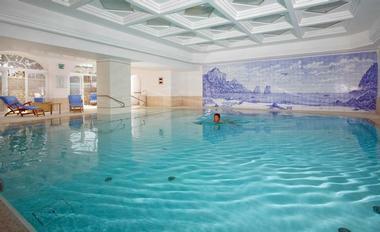 It also features an indoor pool, beauty parlour, jacuzzi, steam room and sauna. Guests can relax by the pool, Quisi Terrace Bar or the Krug Room Wine Bar. Quisi Terrace Bar, located in the front, is a popular meeting spot in the evenings. Enjoy a candlelight dinner at the Quisi Restaurant which serves light Mediterranean cuisine from mid-May to the end of September. The second restaurant, La Colombaia, serves buffet-style regional cuisine. Room rates start at 600 Euro per night. The staff can arrange transportation from the harbor. If you require transportation from Rome or Naples, contact the concierge. Hotel Caesar Augustus has panoramic views of the isle of Capri in Italy from its cliff-top vantage point 1,000 feet above the sea. The sunset from the infinity edge swimming pool is not to be missed. It appears as though the pool blends into the sea. You can explore the towns on Capri, visit hidden beaches and take a ride through the romantic Blue Grotto. There are 56 individually decorated rooms with private balconies and panoramic views. Not all of the rooms have true sea views so ask for a view when you are making your reservation. The Caesar Suite and the Farouk Suite are the two largest and have the best views, perfect for a romantic honeymoon. Enjoy traditional Italian cuisine of Capri and Naples served at the restaurant. Meals are based on a large selection of local products and some vegetables from the hotel's garden. Plan a couples getaway to Italy with one of these unique specials. Whether you are celebrating an anniversary, a honeymoon or another special occasion, Italy offers plenty to choose from. 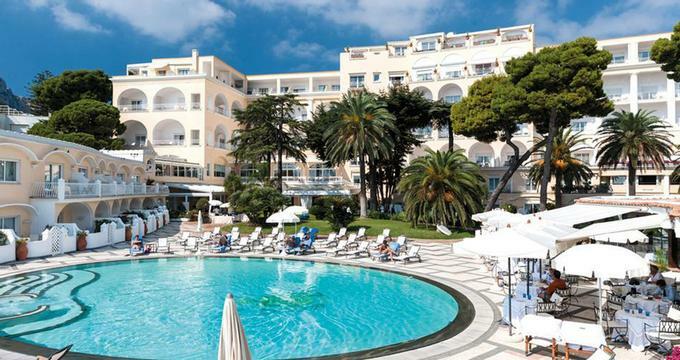 The "Romantic Caesar Escape" at Hotel Caesar Augustus in Capri start at Euro 2,100 for 3 nights and includes: Three nights, Breakfast, Prosecco and strawberries in your room, Candlelight Dinner, massage for two and Transfer from/to the port of Capri. Rates start at €320 for a Garden View Room and €400 for a Superior Deluxe Sea View Room. Remember to check for packages. You won't be able to swim then, but if you visit in the off season, such as in October, November or April, the island will be quiet and even more romantic. At the romantic Hotel Luna Capri you will be surrounded by fragrant gardens, elegant Mediterranean architecture and scenic views of the sea. Lounge by the hotel pool while sipping a cold drink and taking in the view. Light meals are served by the pool in the summer. Guest rooms and suites are stylish and airy, some with balconies overlooking the blue waters of the sea. Ask for a room with a view. The restaurant, open for dinner, serves Mediterrean-inspired cuisine. During the day, dine by the pool. Room rates start at €240 per night, including buffet breakfast. 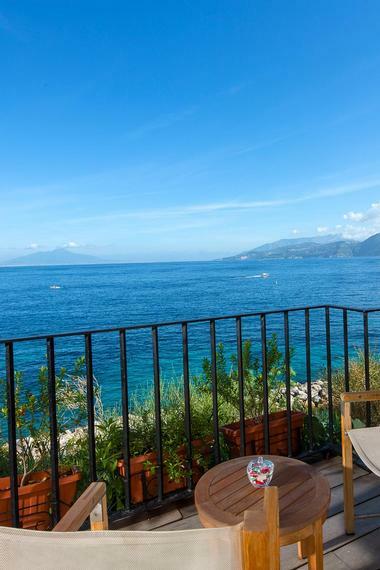 A boutique luxury hotel in Anacapri, Capri, J.K. Capri is a restored 19th century villa with all the accompanying appeal and charisma. Now renovated with modern fixtures and facilities, this shore-side hotel situated amidst the buzz of Marina Grande, yet filled with a calm and peace, is sure to delight guests. There are eight room styles to choose from – ranging from the J.K. Classic Room to the Penthouse Suite. Each pays great attention to detail and is filled with statuesque figures, peculiar trinkets, and exquisite art. Guests can savor a cocktail at the bar, swim laps in the pool, satisfy their taste buds at the restaurant, or bask in the spa. Activities in the area include scuba diving, fishing, hiking, or visiting the magnificent Blue Grotto.